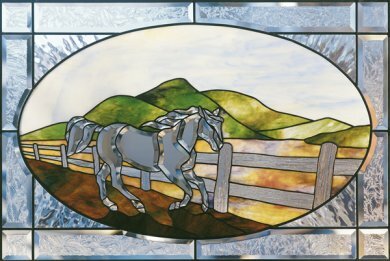 The free spirit of the horse has been captured in both clear and smoky brown clusters. Each finely detailed cluster has 31 pieces. If you're in the Buffalo area, stop in. We have dozens of bevels on sale that haven't made the website! Nice designs, nice prices. These bevels are in limited supply and will not likely be available again in the future. Be sure to order a sufficient supply as reorders may not be possible. Sale prices are good while supplies last. Watch for more bevels to be added in the near future!